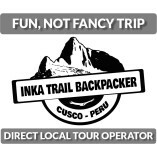 Inka Trail Backpacker an affiliate of the INTI SUN TREK tour company. We offer affordable services for backpackers and travelers, focusing mainly on Inca Trail Tours tailored for backpackers´needs and budgets. By keeping our tour prices low, we give you control over which extra options you add to your trek.